Not all sales processes are created equal. In fact, the whole purpose of developing a sales process for your company is to uniquely match the dynamics of your target audience’s purchasing methods with the approach you use to convince them to buy your “stuff”. One major mistake I see a lot of startups make is thinking that a transactional, SMB-focused sales process can work with large enterprises but just with longer sales cycles and bigger deal sizes. It’s not nearly that simple. There are many books about enterprise sales. In this article I’ll highlight what I think are the key attributes of a successful enterprise sales process while sharing some tips and tricks I picked up during my tenure as an IBM enterprise sales rep and later as Sales VP for an early stage tech company with an enterprise focus. Just as a Series A financing round isn’t simply a large Seed round, an enterprise sales process isn’t an expanded version of an SMB sales process. In fact, possibly the biggest challenge startups face when trying to sell to large enterprises comes from a required attribute many startups can’t afford – TIME. Yes, it’s true that typical enterprise deals take a lot longer than SMB sales. How much longer depends on the average deal size, solution complexity, market adoption/awareness and various other factors. But suffice it to say that with an enterprise sales focus you will be in a mode of “elephant hunting”, which means fewer deals and less often, but when you land them you bring in a lot of fuel to operate the company. Since one luxury startups don’t have is time, you would much rather get a fast “no” from an enterprise prospect than get dragged through a 6-12 month sales process only to get an eventual “no”. No sales person likes to get a slow “no” but in the case of a startup that is regularly projecting their next cash fume date, these are excruciatingly painful and sometimes terminal. Referring to the graphic, you’ll see there are only two desirable outcomes: getting an inevitably slow “yes” or getting a fast “no”. I’m eliminating getting a fast “yes” because, from my experience, they don’t happen in enterprise sales. And if they do, it’s because the deal size is really small and not indicative of the typical or desired deal size that necessitates the enterprise sales process described in this article. The remainder of this article describes various attributes of a successful enterprise sales process, with a primary goal of winning large deals and a secondary goal of quickly identifying when there’s little-to-no chance of winning the deal. Don’t treat this article as a full-blown sales process but rather key attributes that accompany a strong and successful sales process for enterprise targets. Large enterprises move slowly but deliberately, based on a strategic planning process that occurs annually. Budgets and priorities are set based on high-level company goals. Those goals get cascaded throughout the organization, often all the way down to the individual contributing employee but certainly to the department level. Your mission early on in the sales process with a large enterprise is to discover these cascaded set of goals, starting with the key influencers and recommenders for your project and then moving “upward” to their department and ultimately the company level. You’ll do this so that when it comes time to present your proposal and later deal with objections, you must communicate everything in context of helping your prospective customer accomplish their stated goals. Your enterprise prospect is not paying money to get #1 in the list above but rather #4 in the list. HUGE difference and valuable to understand when you enter the inevitable price negotiations. For additional help mapping features to benefits and goals, see my related article titled “The ‘So What’ Rule“. Decision MakerIt’s pretty clear what their role is but just make sure there’s not more than one (see the Decision Process section for more info). It will be extremely difficult to get access to the ultimate Decision Maker but this is a key objective (see Access to Power section for more info). RecommenderThey do much of the research and are actively involved throughout the sales process. There are commonly multiple recommenders. InfluencerThese are sometimes much harder to identify because they might not officially be a part of the project team. But they have the ear of the decision maker(s) and, for some reason, have decided to get involved in the decision process – possibly because it somehow affects them or possibly because the decision maker requested their help. Influencers can sometimes be more valuable to have on your side than the formal Recommenders. ChampionThis is not actually a different role but rather a designation you will give to a Recommender or Influencer that most significantly influences the final decision. They often have emotional involvement in the process, unlike the rest of the members of the evaluation team. A key objective of yours is to identify and work closely with the Champion. With a dozen or more people somehow involved in the decision process, you will need to be organized with this information as you identify and decode the players. This is obviously where your customer relationship management (CRM) system comes in handy. Use it. How will the enterprise prospect go about making their final decision? What activities will be involved? What is the planned sequence of those activities? Is there a recommendation committee? You need to find out because the answers will give you a clue about the decision process that will be used. The decision process and decision criteria operate in synergy with each other. How will the solution alternatives be evaluated? A generic answer is “whichever one best meets our needs” but that’s not a response that helps you very much. If you’ve identified a set of goals per the guidelines mentioned above, you’ll be ahead of most competitors but you still need to find out how various trade-offs will be evaluated. For example, if the highest scoring solution is also by far the most expensive, will cost be taken into consideration? In fact, is there a formal scorecard that you can get your hands on? If not, or if they won’t give it to you, you still must figure out the criteria that will be used to make the decision. Otherwise, you’re flying mostly blind and subjecting yourself to high risk of a slow “no”. The reason you desperately need to meet the decision maker before committing substantial time and resources is 1) to get his/her specific goals 2) confirm that you have some legitimate chance to win the business (seeking a quick “no”, if needed). Prepare yourself for this inevitability because large enterprises all require pilot tests. You might call them a “trial” but essentially the enterprise prospect needs to see your product in action before they are going to make a $200K or larger commitment. What is the enterprise hoping to accomplish from the pilot? Get specific. How long is the pilot test expected to last? It only needs to last long enough to accomplish the stated objective(s). Can you do that in 2 weeks instead of 2 months? Who will be involved from the enterprise and who is your key point of contact? Get specific. What assistance will you be allowed to provide during the pilot test? Sometimes, enterprises want you to install and configure the product and then get out of the way, only providing support if requested. Be careful about this because your ultimate objective is to get a successful outcome. If there are important pre-requisites to a successful pilot of your product (technical, operational, etc), now is the time to ask. Once the pilot test starts, any negative outcomes or delays are reflective on you, your company and your product. So before you start, “measure twice and cut once”. For insights and best practices associated with enterprise POC’s and trials, read my article titled “Getting Maximum Credit From Your Enterprise Trials“. Hopefully you can see how questions like these help identify any remaining objections or reveal that you’re not in the leadership position that you thought you were. The great thing about a “trial close” is that you’re not asking for the ultimate decision, which leaves you options to recover if you don’t get the answer you’re hoping for. 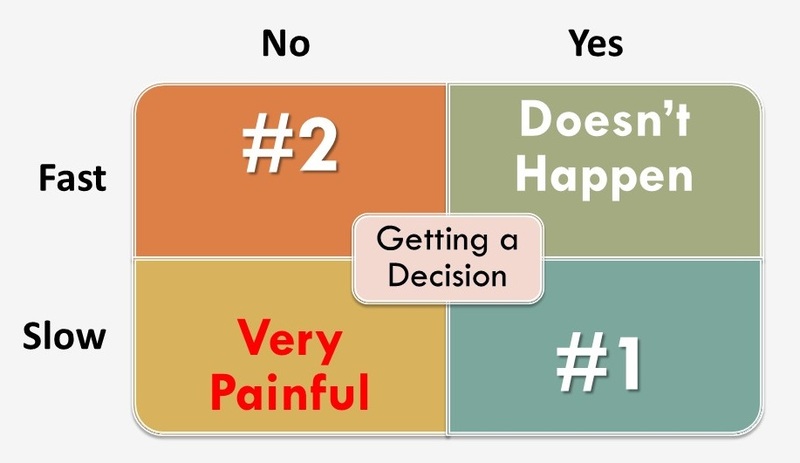 If you thought getting a positive decision was the final step, you’re wrong. For enterprise deals, you’re odds of getting a purchase order might have increased to 90% but you’re probably only 80% of the way through the complete process. You still have to go through pricing and contract negotiations and then the administrative process of purchasing. Both are topics for another article but I can tell you that many enterprise deals get delayed 2 months or more for these final steps. One month is considered favorable and 4-6 months is not unheard of, unfortunately. So if you are still in your startup or early phases of evolution and don’t have a ton of cash in the bank, don’t go hire those two new developers just because you got a winning “decision” at a large enterprise. Just in the same way an investor isn’t fully “closed” until their funds hit the bank, an enterprise deal isn’t fully “closed” until you get a purchase order and deliver the product. Even then, many enterprises are also slow to pay their invoices (45-60 days is common) but that’s also a topic for another article. You must understand that the primary way the enterprise Purchasing department shows its value to the organization is to beat the vendors down on their price. So when they bring out their sledgehammer to use on your, make sure they understand specifically how your product has already proven (via the pilot test) that it will help them accomplish one or more strategic goals. The purchase agent will not care (or won’t seem to care), so if their demands seem ridiculous you might need to call on the support of your project Champion or the executive they report to. They are the ones that care about accomplishing their goals. I have a personal story in which this exact strategy was used to negotiate a $1.8M deal with a US Fortune 500 corporation at LIST PRICE! If I haven’t yet convinced you that enterprise sales is different than SMB sales, this is my final chance. Most products sold to enterprises have a level of complexity that is beyond SMB-focused products. And when I say “complexity”, it could be a technical complexity for operating the product. Or it could be complexity related to installing, configuring and integrating it into the enterprise environment. Either way, the expertise needed to demonstrate and ultimately sell most enterprise products is beyond what a sales representative alone possesses. Because of this, you might hear the term “4-legged sales calls” in context of enterprise sales. It simply means that a 2-person team (4 legs between them) is required to handle the start-to-finish enterprise sales process. Obviously, the sales rep is one member of the team. The other is the sales engineer (SE). The SE often leads the product demonstrations and always oversees the on-site pilot test. They serve as the lead for all things technical throughout the sales engagement and good ones are worth their weight in gold, even though they usually get less glory than the sales rep.